DIRTY MEDICINE by Martin Walker. In 1987 the Wellcome Foundation one of Britain's largest multi-national drug companies, obtained a license for the drug Zidovudine, known as AZT. 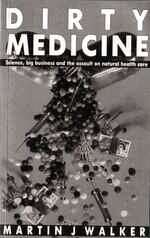 AZT was heralded by the media and marketed by Wellcome as if it was the answer to the AIDS epidemic. Packaged and promoted like any other commodity, public relations companies and advertising agencies hyped AZT from Romania to Uruguay. In 1992 the Foundation made nearly £200 million profit from the drug. With the marketing of AZT, the campaign against alternative and complementary medicine was suddenly transformed from an academic dispute to a war. Dirty tricks, industrial sabotage and character assassination replaced normal business and scientific practice. Dirty Medicine, is a frightening story of the free market, at war with the powerless. It exposes how, under the guise of government regulation, big business, science and medical orthodoxy defended their products and profits from competition.